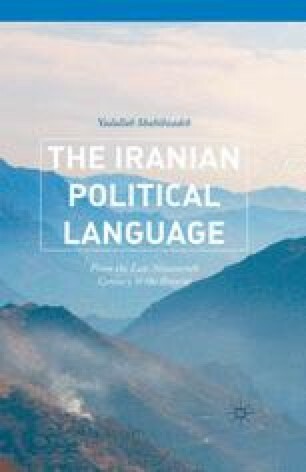 This chapter examines the historical transformation of the concept of democracy as an essential concept of the Iranian political language since the constitutional revolution. A conceptual history of democracy may help us to understand the Iranian people’s spaces of political experience and democratic expectations. Through their political experiences and expectations, the Iranian people have defined their own historical time. According to Johann Gottfried von Herder, “Every mutable thing has within itself the measure of its time.” 1 The Iranian measure of time established a relation between the Iranian society’s past and present, and enabled the Iranian people to regulate their expectations and hopes concerning their space of experience. Thus, the Iranian people’s experiences of historical times are expressed through different concepts they exchange with one another in various ways and in different historical periods. Through a historiography of the concept of democracy, we can distinguish between democracy’s different meanings and scrutinize the political passion these meanings of democracy have generated among the Iranian people.